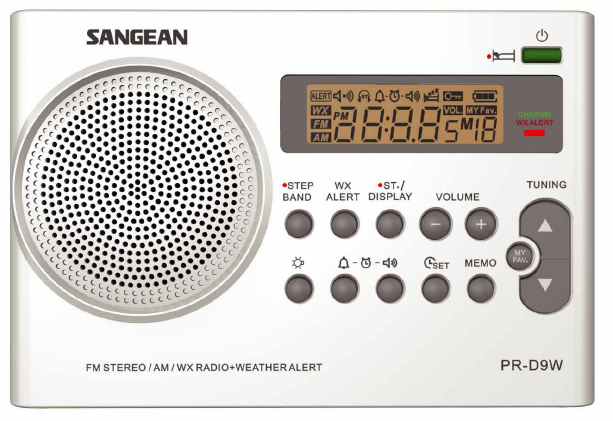 The Sangean PR-D9W AM/FM Weather Alert portable radio is a perfect companion at a picnic, a ball game, a camping trip, and even to keep you informed at home through severe weather conditions and other emergencies or power outages. The 2.5 inch, 8 ohm speaker provides a full sound. The PR-D9W is a versatile device, a well-designed portable AM/FM radio coupled with a Weather Radio for updates and emergencies. It features a built in dual alarm clock that can wake you up in the morning, 19 total memory presets, auto scan tuning, lock switch, super capacitor back up power for clock and memory presets, sleep and snooze function and easy to read large LCD display with adjustable illumination. The clock may be set to either 12 or 24 hour format. There is a battery charging LED and battery power indicator. The back panel has a battery type selection switch for either Alkaline or NiMH/NiCad batteries. This radio requires four AA cells (not supplied). Includes ADP-PRD18 AC adapter.